Heat the oven to 375°F. Grate the zest from half the lemon. Beat the egg and water in a small bowl with a fork. Stir the crabmeat, cream cheese, onions, Gouda cheese, sour cream, seafood seasoning, celery seed and lemon zest in a medium bowl. Unfold the pastry sheet on a lightly floured surface. 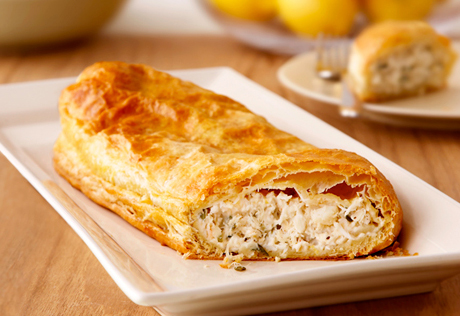 Spread the crab mixture on the bottom half of the pastry to within 1 inch of the edge. Fold up the sides of the pastry over the filling. Roll up like a jellyroll. Place the pastry, seam-side down, onto a baking sheet. Tuck the ends under to seal. Brush the pastry with the egg mixture. Bake for 25 minutes or until the pastry is golden brown. Let the pastry cool on the baking sheet on a wire rack for 10 minutes.